Cape Town Huey Combat Flying Trips, Rides in a Cape Town Huey Helicopter. The Huey is considered to be the most widely used helicopter in the world, with more than 9,000 produced from the 1950s to the present, the Huey is flown today by about 40 countries. 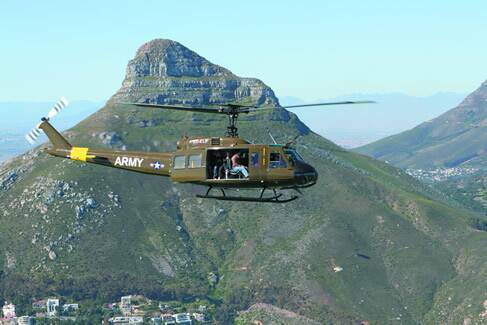 Join us for a Huey Helicopter Tour - Cape Town South Africa. This Huey Helicopter Cape Town experience also makes an ideal gift voucher for an unforgettable experience of a life time! pumping in your veins as you maneuver through the Blouberg Hills. A simulated combat mission which will leave you hanging on the edge of your sea, begging for more! Huey Helicopter - Cape Town South Africa. Departures daily. The Huey that we are flying has done two tours in Vietnam and spent a great deal of its life training pilots at Fort Rucker, Alabama USA. The authentic experience!! FLY the HUEY - Live the Dream!! 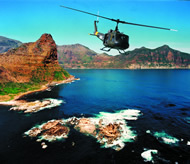 30 min Huey Helicopter Combat Tour: R4, 400.00 Per Person !!! Click Here to request a Private Chartered Helicopter Tour or Flight - Located at the Waterfront, Cape Town, South Africa. The advantage of booking a private charter is that you can pick a time which suites your holiday Schedule and the flight will always be guaranteed. Huey Helicopter Flights / Tours Cape Town South Africa. Online Cape Town Helicopter Tours offers flights from the V&A Waterfront Helipad in association with Sport Helicopters who have been flying passengers around Cape Town and the Western Cape for the last 17 years. Please note that the Huey Combat flight is the only Tour that is sold on a Per Person Rate. Click here to view other affordable Cape Town Helicopter Scenic Per Person Guided Tour Options. These flights are fully guided and you can choose a time and a package that suits you. The Huey Helicopter saw combat in Vietnam in 1963, first as troop transport, but before the end of the conflict 7000 of these versatile helicopters were flying for Medevac, air assault, gun ships, utility, evacuation and troop supply transport. Not only did it earn its fame during the Vietnam War, it has also been featured in many war movies, including Apocalypse Now, Platoon and We Were Soldiers, making it not only the most recognisable helicopter but also the famous helicopter of the 20th Century. Or if video is mark as unavailable, either refresh the webpage or click the link listed below. If you have a slower Internet connection, you might need to let it run in pause mode for a few minutes, so that the clip can run through. If you experience constant pauses, it means that the movie is buffering itself as it downloads. CLICK HERE for full Shark Cage Diving Tour Description. Cage Dive with Great White Sharks In Gansbaai - South Africa. Book Online Today! No Diving Experience. Trip Advisor Winner· Eco Friendly Services. Free pick up and drop off from your hotel or Guest House & en-route to Gansbaai or selfdrive to gansbaai.